Sunday School Redux | Yo, Yenta! Thas’ right, the Yenta’s back in her old classroom, herding the little Jewish kindergarteners into circle time and picking sequins out of my hair on Sundays. I know I left my post a year and half ago to have just the tiniest amount of free time, maybe spend a morning alone with El Yenta Man noodging him to clean out the chicken coop or leisurely reading a magazine while drinking fifteen cups of tea. Since my new job is even more booty-kicking than the old one, it’s been nice to have a couple of hours to spend in the garden or perform a thorough examination of my sock drawer. But I couldn’t stay away from the bissel yiddishe kinders. I missed making mezuzot out of cardboard tubes salvaged from dry cleaning hangers and explaining the nuances of animal reproduction on board Noah’s Ark. I love seeing the looks on their faces when I announce that God made the world in 11 and a half days and then go, “What? Is that not right?” I also really love apple juice and crackers. Plus, the nice lady who replaced me left to have a baby. Things have changed a little at the Shalom School since the last time I led a rousing version of the “Dovid Melech Yisrael” hand jive. We have an awesome new principal, who’s incorporated more religious study for the older kids and incentives for everyone getting their tushies there on time. Our transitional rabbi has brought ruach and balloon animals into the mix. And the kids from my first class back in 2007 are in fourth grade already. 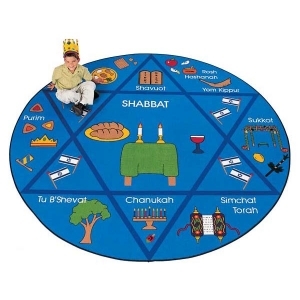 It feels kind of amazing to know I’ve contributed to their Jewish education, that maybe all the Aleph Bet yoga helped them with their Hebrew lessons, that the “Shhhhhh-Mmmmmm-Ahhhh” breathing exercises I use to calm the room when everyone’s spazzing out after snack time might aid them in finding personal peace. I must’ve made some kind of impression because they all remember me. In fact, one stopped me in the hall last week to tell me he still had the Moses baby basket we made until his dog ate the stryofoam head a couple of months ago. No, it’s not like he named his first child after me, but look, I’ve got to find something to keep me motivated on Sunday mornings. This entry was posted in The Weirdest Sunday School Class in the South by Head Yenta. Bookmark the permalink. yenta shalom school missed you and will never be the same without you not to mention that its a mitzvah and we all know how much you looooove doing mitzvahs right ?? ?